Heat oven to 450°F. In small bowl, mix all sauce ingredients until well blended; set aside. Make pie crust as directed on box for One-Crust Baked Shell using 9-inch glass pie plate. Bake 9 to 11 minutes or until golden brown. Cool completely, about 30 minutes. In medium bowl, toss banana slices with 3 tablespoons of the sauce until coated. Layer bananas in bottom of cooled baked shell. In large bowl, beat milk and pudding mix with wire whisk 2 minutes or until thickened. In small bowl, beat whipping cream with electric mixer on high until stiff peaks form. Fold into pudding until well combined. Spread evenly over bananas. Refrigerate 2 to 4 hours or until firm. 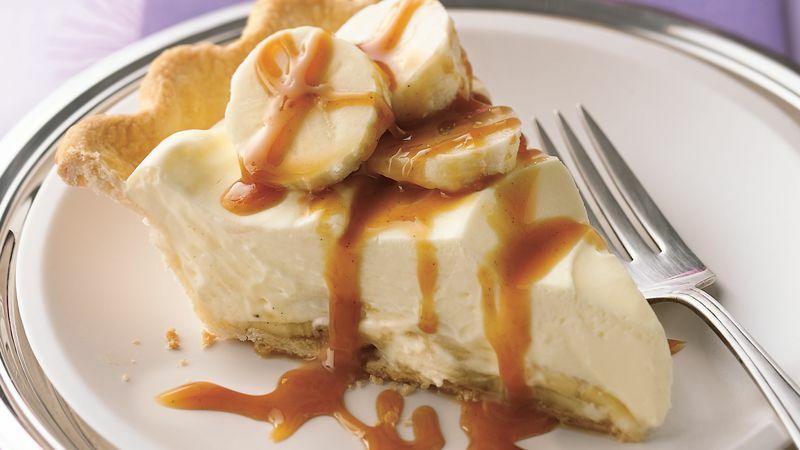 Top individual servings of pie with additional banana slices and sauce. Store in refrigerator. You’ll want to use firm bananas for this recipe. For extra speedy preparation, use thawed whipped topping to fold into the pudding.